Hey guys, if you guys haven’t noticed from the lack of updates, I’ve been extremely busy. I’ve also accumulated a large backlog of messages sent through the contact page. My apologies. I am in the process of replying to all inquiries sent in the last couple months. If you sent me an e-mail and I have not responded yet, please feel free to re-send your message. My crafting script has been updated to v1.11. It adds only one new very minor feature. I mainly did it to get back into coding mood. My hope is to add some more features such as crafting levels and crafting experience points in the future, just to name a few. I’ve been told that there have been issues with sound effect files played with this script, but I have not been able to replicate them. Unfortunately, I cannot fix sound effect issues unless I can replicate them myself. Continue to the Tactics Ogre PSP Crafting System page. This script (hopefully) will help developers better organize and manage their database Noteboxes. Looks like there are so many notetags out there that the tiny little Note box makes things a bit difficult. Continue to the Load Notes from Text Files page. Thanks to the input I’ve received from people here, here, and comments elsewhere, it is quite apparent that there is a demand for a crafting system where players are allowed to select their own items and combine them in order to obtain a new item. Because of this, I will try to begin production on a new crafting system script. 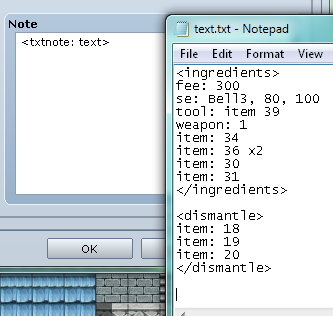 My goal is to make it intuitive as my previous crafting script. Currently, I’m still a bit stumped as to how the user-interface should look which is the main reason why I’m hesitant to say when production of this script will actually start. But I already have a design for how to define recipes so hopefully I can start on it soon. My crafting system script has been significantly updated with the ability to view an item’s statistics and other information when viewed in the crafting scene. 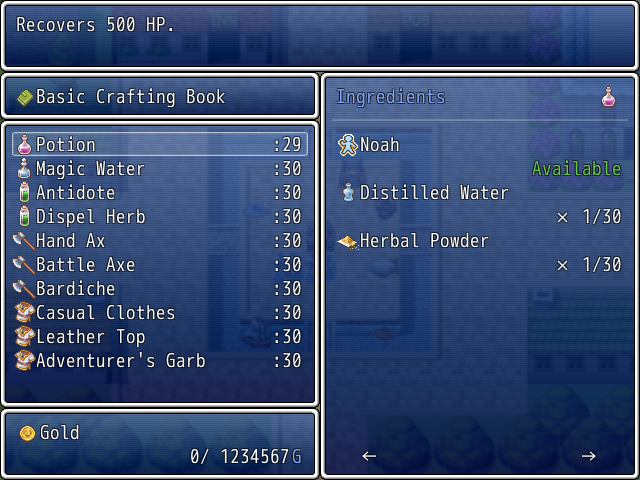 Players are now able to view all ingredients for an item no matter how many different ingredients it has. There’s also some other updates you can read about. Please let me know of any bugs. 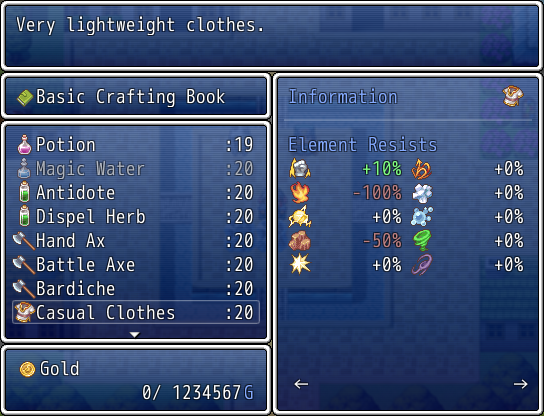 Also, feel free to request if you want any particular kind of information to be displayed in the crafting scene’s info window such as effects from other custom scripts. There’s not much for me to say about this to non-scripters other than that this script will be supplementary to future scripts I plan on creating. Continue to the Reader Functions for Features/Effects page. Most of the KMS Generic Gauge patches have been updated for the latest Generic Gauge update. There’s also a couple new ones. A reminder that I’m still open to making Generic Gauge patches. Continue to the KMS Generic Gauge Compatibility Patches page.